I'm not sure I've shared this here on the blog, but I was chosen to host a Gooseberry Patch Cookbook Preview Party!! 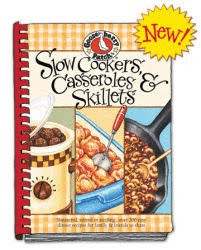 I must say I was very excited to receive my very own copy of Slow Cookers, Casseroles & Skillets and a copy to give away at my party!! 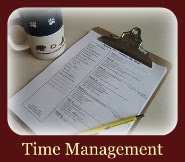 "Here's how to check whether a slow cooker is heating to the right temperature. Pour 8 cups of water into the crock, cover and heat on low setting for 8 hours. Uncover and immediately check to water temperature with an instant-read kitchen thermometer. If the slow cooker is working properly, it will read 185 degrees." "If a favorite non-stick skillet has gotten sticky, here's a simple solution. Fill it with one cup water, 1/2 cup vinegar and 2 tablespoons baking soda. Bring to a boil for a few minutes. Rinse well with hot water and wipe clean...no more stickiness!" Do ya'll have any kitchen tips you'd like to share? Great minds think alike! We just posted a dozen tips from this very book...check 'em out on the blog! I think the tips in all the cookbooks are a great added bonus!! Love your books GBP! !